Focusing on all things SharePoint with Microsoft South Africa, global technology consultancy Mint’s Employee Engagement practice showcased its solutions, culture and innovation at SharePoint Saturday on October 8, 2016, as a silver sponsor of the event. SharePoint Saturday is an educational, informative and fun-filled day where information workers, IT pros and developers collaborate and showcase their solution offerings. 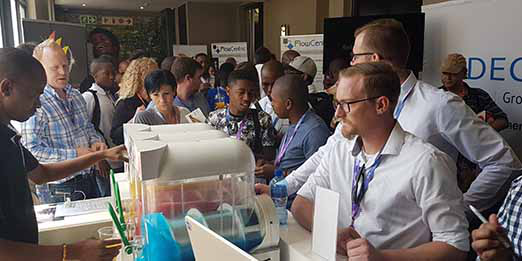 Attendees also reflect on the latest SharePoint trends and developments while hustling to enter competitions and attend sessions. The event’s informative sessions, hosted by SharePoint evangelists, fanatics and experts, focused on current SharePoint trends and facets, such as building web-based forms and databases, hybrid search, distributed website content management, effective document capture, and mobile apps and services for the digital workspace. Mint Group SharePoint Specialist Consultant, Andrew Thornton-Smith, presented a session dubbed ‘Tired of sluggish SharePoint farms? Let’s whip out the hot sauce and rub it in SharePoint’s eye’. Ingeniously titled and highly interactive, the session delved into the pain points that organisations, developers and administrators experience with the technology. “There are many different things to be aware of when speccing out your farm. If it is not properly specced it will not perform to the best of it abilities,” Thornton-Smith explained to the session attendees, adding that the SQL configuration, including disk connectivity to each logical unit number and disk layout configuration are extremely important considerations when setting up your SharePoint farm. He further delved into how organisations can derive optimum functionality out of their SQL server, the different forms of caching available, the resource intensive service applications that will commonly bog down a SharePoint farm, and search functionality.